There is a huge market for small guns, and it makes sense. There are entire sections of the internet dedicated to telling people how difficult it is to carry a full size gun. 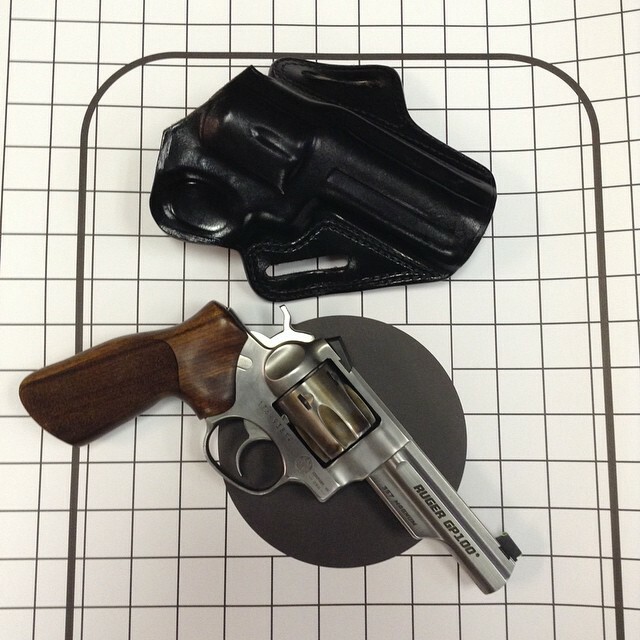 A few weeks ago, I decided to conduct a science experiment by carrying a full size Ruger GP100 with a four inch barrel in an OWB leather concealment holster. The holster I chose is a Galco Fletch, which normally has a thumb break, but has been…”customized” by removing the thumb break and snap with a pair of kitchen shears. Classy, I know. I’ve had that holster for a long time, and I figured it would be a perfect choice for my experiment. After selecting the gun and the holster, it was time to select various concealment garments. Over the course of the experiment I used the following: t-shirts over the gun, zip-up hoodies over the gun, and my beloved (and now discontinued) Woolrich fleece tactical vest. All of these worked just fine. I was initially concerned with printing when concealing the whole holster under an untucked shirt, but after wearing that rig in the summer for a while, I remembered that NO ONE IS PAYING ATTENTION. It was interesting, because to me, to the people in my office, the lumpy bulge under my shirt was Obviously a Gun. But to people walking down the street? I was just a dude in an ill-fitting t-shirt. Plus, I do live in a pretty permissive state when it comes to guns, so if the tip of my holster peeks out in the grocery store, no one is going to bat an eye. One of the difficult things about carrying a full size gun was that it made dressing like an adult a little bit more difficult. Owning a business, I get to wear whatever I want, but I don’t always want to wear an untucked t-shirt. An un-tucked polo is a good choice, especially if it’s fitted correctly so that it’s tighter across the chest and shoulders and then baggier near the waist. I used that method to conceal a gun in an OWB holster. Probably the best concealment garment I’ve seen so far is a zip-up hooded sweatshirt. Zip-ups, for whatever reason, look nicer than regular hoodies, and don’t seem to scream “I’m going to the gym/I hate laundry” as much. For me they’re a great choice, especially with fall weather hitting us now in DTSF. This week, I switched holsters. After carrying in a full size OWB holster, I’ve moved to an IWB. Also a Galco, this time a Summer Comfort which was featured on the blog yesterday. It’s even easier to conceal. The but of the gun rides high enough that with my arms hanging naturally at my sides it hides the gun effectively, and the bulge is even less pronounced than it was with the OWB. The biggest problem with the OWB rig is that the bottom of the holster would pop out pretty frequently. The IWB obviously solves that. So, the moral of the story? You can carry a full size gun. People won’t notice. Of course, if you’re in an NPE or somewhere where people noticing would have big time negative consequences, make sure your concealment is on lock-down. No untucked t-shirts for NPEs. Good post. There is a bit of “one size fits all” attitude at work in today’s concealed carry market, as if the needs of someone working in an urban office are identical to those of someone who is walking his dog in woods and encountering random drug deals. The former requires a lot more discretion than the latter, but nowadays just mentioning you carry something reasonably sized (like a Glock 19) is grounds for an online beating, as if carrying anything larger than a single-stack 380 will inevitably result in a SWAT callout. Or more simply put, size matters — just not as much as we think it does. “Adults” wear sport coats and jackets over their tucked in dress shirts and even polos. Add a couple casual lightweight ones to your wardrobe, throw them on when it matters and leave ’em off or in the car when it doesn’t and you are set. Also adds pockets for flashlight and stuff. I have loads of sport coats and jackets. That’s nice unless you live, as I do, where the temperatures frequently exceed 100 degrees for weeks at a time. Not only is that idea uncomfortable, but it also makes you stand out. Then obviously that doesn’t apply to you in your particular area. Though people wore, and still wear, suits everywhere, in every climate in the US, as a matter of course. “Can’t” and “not willing to” are not synonymous. Log on Amazon. Look up the Tactical v-neck cotton-spandex under shirt. Still cool in the Hottest temps. Black or white. I have one about $40.00?. Has gun holster pocket with safety straps both sides under arm pits for large frame handguns. Accessorie pockets for cell phone and/or I pad and folding knife. Easy wash and dries in minutes. Follow up, they also have underware as same with large frame safety strapped holster in small of back area. Black/White also. Holster choice is key. When I first started carrying, I bought a relatively inexpensive kydex IWB holster because I saw it on a YouTube video. It rode so high and awkward, that I could barely conceal my Glock 26. I bought a hybrid IWB and it immediately disappeared. I had one of those M&P CO2 BB pistols, and stuck that in there. That’s when I realized I could carry a bigger gun. I promptly traded up for a 19. Now, I might have the opportunity to trade it for a S&W 66, so I’ll have to find a new holster. I wonder if people who require defibrillators, colostomy bags or insulin pumps are as self conscience as we are about what we have hidden under our clothes? To me the hardest thing about carrying a full sized gun is the weight. Granted I could use some toughening up. Pro tip from a FAM friend. Bring your sports coat to a tailor and have them spit the liner in the back and sew in a piece of spandex. Supposedly it makes for a much faster/easier draw (and looks way cooler at an IDPA match than a fishing vest). You would carry something smaller if you had a job where you could get fired if you’re made. Otherwise it’d be G19 all day err’y day. I carry a full sized Glock Mod. 20 in a Galco Horizontal carry position sewed onto the back of a construction type back support brace. The ones with the shoulder straps only like suspenders. It comfortable to wear most of the time except when its in the “90’s where I live. Is secure and safe. I wear it when horseback riding and dirt biking in the desert. Stays put in the small of the back with an added pad in the lumbar region to prevent gougeing my back. Use heavy waxed thread and double stitch everything down tight. On the holster have a tension screw & the safety starp both a velcro strip and a snap set to. Make the strap extra long so you can disingage from opposite side depending if right or left. All you need is a large baggy hawaiian shirt with a eye hurting and eye popping pattern. I’m mildly surprised that you didn’t use this as an opportunity to bust the myth that a shorter barrel on a given frame makes a gun much more concealable. If your revolver is K frame, a 2″ isn’t much more concealable than a 4″, with the same stocks and holster style. This most especially true in an IWB. Looks a lot my my revolver setup, Security Six with maybe the same Galco, cept I kept the thumb break, used to it and like that extra security. Almost always carry full size, Glock 17 and Security Six, depending. .44 Bulldog in a fanny pack sometimes on the fly. Just ordered a 99% used Bulldog in.44 spcl. 2 days ago. Second one from the other a long time ago. Waiting for delivery now from Buds Gun Shop. Yo! I have a thing about people who make up acronyms and don’t spell them out first. NPE: Non-permissive environment. A place where the carrying of a gun could get you in serious trouble. For example, if your workplace forbids carry, it would be an NPE. DTSF: Downtown Sioux Falls. Where I live. This summer I found myself carrying my P228 OWB more often than anything else and as long as I had a somewhat loose fitting shirt it was just fine. For the occasional “NPE” I went to the P239 IWB, though it didn’t happen very often. Ultimately I’ve decided that I’d rather carry a larger gun, because I want to carry a gun I can shoot well, and I’d rather shoot a larger gun than a smaller gun so I’ll have more practice with the former. yrs. 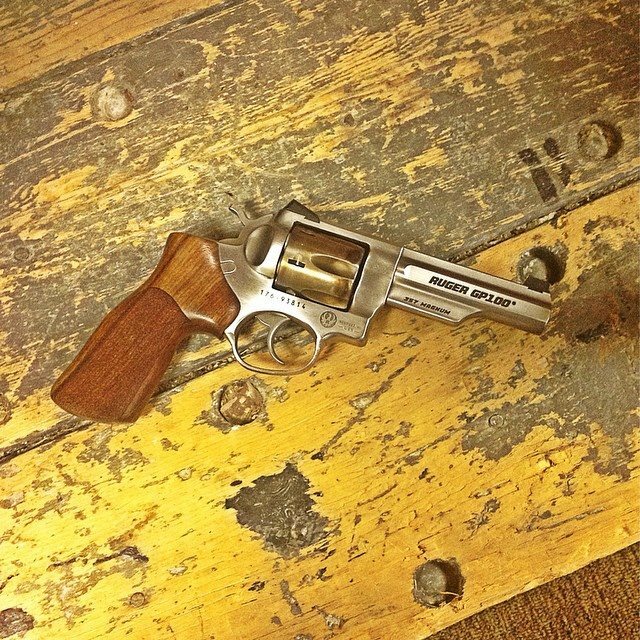 ago bought a Charter Arms 3″ .44 spcl. in stainless steel. Couple days ago found another used 99% condition. A matched pair now, diff serial #’s though,. Waiting for it now from Buds Gun shop. Has Crimson Trace Grips for 400.00 something +. Cant remember right now; not in front of me to see. Somebody called this conditional concealed carry. Those who understand what the bulge is are not the ones who would freak out. Those who would freak out are too busy munching grass to comprehend what it is. That and so many people belt carry IPhones now nobody thinks anything about a three-O’clock bulge anymore so being marginally concealed is easier to pull off than ever. I carry a g22 with a tuckable IWB. I carry a kymber 45 eclipse pro 11 and have no problems with it being concealed with the tactical v neck tee shirt or on my belt with a fishing type vest the ones with pockets inside and out.so carry what will stop a thug hyped up on drugs!!! Rednerd that’s funny you bring up insulin pumps and being aware of what we are wearing. I am a type 1 diabetic, have an insulin pump, and I carry a gen 3 G17, extra mag, OTF pocket knife and my cell phone along with some other things on me. As with all the other people on here, you get crafty at hiding things. A Deringer up the rear end will work too. Thats why the police give a body cavity search on Arrest if suspected. Give the police a hard time and they will surely give you one back.